Definition at line 56 of file llpreviewscript.h. Definition at line 376 of file llpreviewscript.cpp. References LLFloater::close(), deleteBridges(), LLFloaterScriptSearch::getEditorCore(), and LLFloaterScriptSearch::getInstance(). Definition at line 554 of file llpreviewscript.cpp. References LLComboBox::add(), ADD_TOP, LLComboBox::addElement(), LLUICtrlFactory::getComboBoxByName(), LLComboBox::getCurrentIndex(), LLFloater::getFloaterByHandle(), gUICtrlFactory, MAX_HISTORY_COUNT, mLiveHelpHandle, mLiveHelpHistorySize, LLComboBox::remove(), S32, LLComboBox::selectFirstItem(), and LLComboBox::setSimple(). Referenced by onHelpComboCommit(), and setHelpPage(). Definition at line 597 of file llpreviewscript.cpp. References LLViewerWindow::alertXml(), FALSE, gViewerWindow, handleSaveChangesDialog(), LLTextEditor::isPristine(), mEditor, mForceClose, and TRUE. 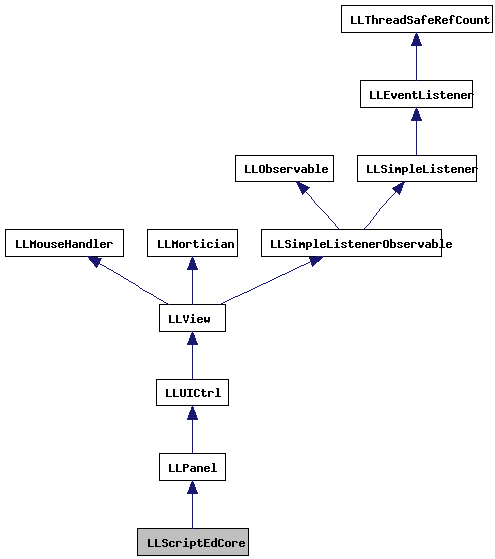 Referenced by LLLiveLSLEditor::canClose(), and LLPreviewLSL::canClose(). Definition at line 1014 of file llpreviewscript.cpp. References LLDynamicArray< Type, BlockSize >::count(), count, LLDynamicArray< Type, BlockSize >::get(), i, mBridges, NULL, LLDynamicArray< Type, BlockSize >::reset(), and S32. Definition at line 800 of file llpreviewscript.cpp. References gViewerStats, LLViewerStats::incStat(), and LLViewerStats::ST_LSL_SAVE_COUNT. Referenced by handleSaveChangesDialog(), and onBtnSave(). Definition at line 445 of file llpreviewscript.cpp. References LLPanel::childSetEnabled(), LLPanel::childSetText(), LLPanel::draw(), FALSE, LLTextEditor::getCurrentLineAndColumn(), LLUICtrl::hasFocus(), LLTextEditor::isPristine(), llformat(), mEditor, LLStringBase< char >::null, S32, and updateDynamicHelp(). Definition at line 920 of file llpreviewscript.cpp. Definition at line 912 of file llpreviewscript.cpp. Definition at line 944 of file llpreviewscript.cpp. Definition at line 928 of file llpreviewscript.cpp. Definition at line 904 of file llpreviewscript.cpp. Definition at line 936 of file llpreviewscript.cpp. Definition at line 896 of file llpreviewscript.cpp. Definition at line 1028 of file llpreviewscript.cpp. References FALSE, LLView::getEnabled(), LLView::getVisible(), MASK_CONTROL, MASK_MODIFIERS, mSaveCallback, mSearchReplaceCallback, mUserdata, and TRUE. Definition at line 976 of file llpreviewscript.cpp. Definition at line 612 of file llpreviewscript.cpp. References app_abort_quit(), doSave(), and TRUE. Definition at line 437 of file llpreviewscript.cpp. Definition at line 389 of file llpreviewscript.cpp. References enableCopyMenu(), enableCutMenu(), enablePasteMenu(), enableRedoMenu(), enableSelectAllMenu(), enableUndoMenu(), LLUICtrlFactory::getMenuItemCallByName(), hasChanged(), NULL, onBtnDynamicHelp(), onBtnHelp(), onBtnSave(), onBtnUndoChanges(), onCopyMenu(), onCutMenu(), onPasteMenu(), onRedoMenu(), onSearchMenu(), onSelectAllMenu(), onUndoMenu(), LLMenuItemCallGL::setEnabledCallback(), and LLMenuItemCallGL::setMenuCallback(). Definition at line 661 of file llpreviewscript.cpp. References LLComboBox::add(), LLUICtrlFactory::buildFloater(), LLPanel::childSetAction(), LLPanel::childSetCommitCallback(), LLPanel::childSetValue(), LLControlGroup::getBOOL(), LLUICtrlFactory::getComboBoxByName(), LLFloater::getFloaterByHandle(), LLPanel::getHandle(), LLView::getParent(), LLUICtrlFactory::getWebBrowserCtrlByName(), gSavedSettings, gUICtrlFactory, mEditor, LLTextEditor::mKeywords, mLastHelpToken, mLiveHelpHandle, mLiveHelpHistorySize, LLKeywordToken::mToken, LLKeywords::mWordTokenMap, NULL, onCheckLock(), onClickBack(), onClickForward(), onHelpComboCommit(), LLFloater::setFocus(), LLComboBox::sortByName(), TRUE, updateDynamicHelp(), and wstring_to_utf8str(). Definition at line 653 of file llpreviewscript.cpp. References LLViewerWindow::alertXml(), gViewerWindow, and onHelpWebDialog(). Definition at line 786 of file llpreviewscript.cpp. Definition at line 753 of file llpreviewscript.cpp. Definition at line 816 of file llpreviewscript.cpp. Definition at line 823 of file llpreviewscript.cpp. References LLViewerWindow::alertXml(), gViewerWindow, and handleReloadFromServerDialog(). Definition at line 742 of file llpreviewscript.cpp. References LLSD::asBoolean(), LLUICtrl::getValue(), gSavedSettings, mLastHelpToken, NULL, and LLControlGroup::setBOOL(). Definition at line 708 of file llpreviewscript.cpp. References LLFloater::getFloaterByHandle(), LLUICtrlFactory::getWebBrowserCtrlByName(), and mLiveHelpHandle. Definition at line 725 of file llpreviewscript.cpp. Definition at line 864 of file llpreviewscript.cpp. Definition at line 856 of file llpreviewscript.cpp. Definition at line 888 of file llpreviewscript.cpp. Definition at line 952 of file llpreviewscript.cpp. References LLScrollListItem::getColumn(), LLScrollListCell::getText(), LLStringBase< char >::replaceChar(), S32, and TRUE. Definition at line 764 of file llpreviewscript.cpp. References addHelpItemToHistory(), LLSD::asString(), gDirUtilp, LLFloater::getFloaterByHandle(), LLControlGroup::getString(), LLUICtrl::getValue(), LLUICtrlFactory::getWebBrowserCtrlByName(), LLDir::getWorkingDir(), gSavedSettings, gUICtrlFactory, mLiveHelpHandle, and LLUIString::setArg(). Definition at line 638 of file llpreviewscript.cpp. Definition at line 872 of file llpreviewscript.cpp. Definition at line 848 of file llpreviewscript.cpp. Definition at line 833 of file llpreviewscript.cpp. Definition at line 880 of file llpreviewscript.cpp. Definition at line 840 of file llpreviewscript.cpp. Definition at line 998 of file llpreviewscript.cpp. References mErrorList, onErrorList(), and LLScrollListCtrl::selectFirstItem(). Referenced by LLLiveLSLEditor::callbackLSLCompileFailed(), LLPreviewLSL::callbackLSLCompileFailed(), LLLiveLSLEditor::uploadAssetLegacy(), and LLPreviewLSL::uploadAssetLegacy(). Definition at line 533 of file llpreviewscript.cpp. References addHelpItemToHistory(), gDirUtilp, LLUICtrlFactory::getComboBoxByName(), LLFloater::getFloaterByHandle(), LLControlGroup::getString(), LLUICtrlFactory::getWebBrowserCtrlByName(), LLDir::getWorkingDir(), gSavedSettings, gUICtrlFactory, mLiveHelpHandle, and LLUIString::setArg(). Definition at line 469 of file llpreviewscript.cpp. 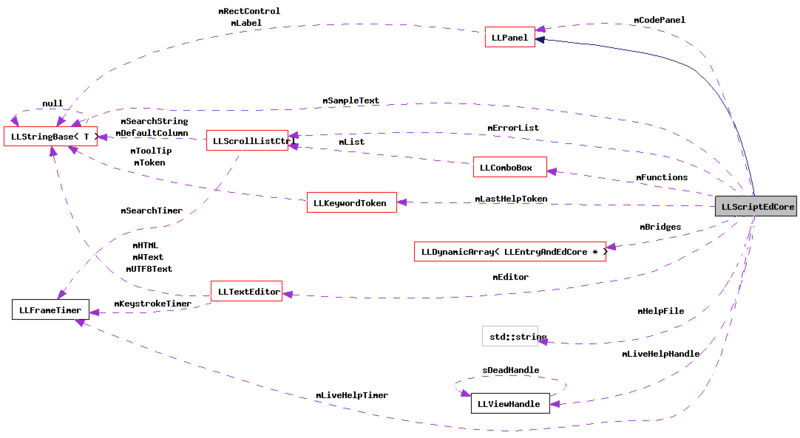 References LLControlGroup::getBOOL(), LLUICtrlFactory::getButtonByName(), LLFrameTimer::getElapsedTimeF32(), LLFloater::getFloaterByHandle(), LLTextEditor::getPreviousSegment(), LLTextEditor::getSelectedSegments(), LLFrameTimer::getStarted(), LLTextEditor::getText(), LLTextSegment::getToken(), LLKeywordToken::getType(), LLUICtrlFactory::getWebBrowserCtrlByName(), gSavedSettings, LIVE_HELP_REFRESH_TIME, mEditor, mLastHelpToken, mLiveHelpHandle, mLiveHelpTimer, NULL, LLView::setEnabled(), setHelpPage(), LLFrameTimer::start(), LLFrameTimer::stop(), and LLKeywordToken::WORD. Referenced by draw(), and onBtnDynamicHelp(). Definition at line 62 of file llpreviewscript.h. Definition at line 61 of file llpreviewscript.h. Definition at line 60 of file llpreviewscript.h. Definition at line 59 of file llpreviewscript.h. Definition at line 58 of file llpreviewscript.h. Definition at line 144 of file llpreviewscript.h. Definition at line 142 of file llpreviewscript.h. Definition at line 134 of file llpreviewscript.h. Referenced by canClose(), draw(), LLFloaterScriptSearch::handleBtnReplace(), LLFloaterScriptSearch::handleBtnReplaceAll(), LLFloaterScriptSearch::handleBtnSearch(), LLLiveLSLEditor::LLLiveLSLEditor(), LLLiveLSLEditor::loadAsset(), LLPreviewLSL::loadAsset(), LLLiveLSLEditor::loadScriptText(), onBtnDynamicHelp(), LLPreviewLSL::onLoadComplete(), LLLiveLSLEditor::saveIfNeeded(), LLPreviewLSL::saveIfNeeded(), and updateDynamicHelp(). Definition at line 143 of file llpreviewscript.h. Referenced by LLLiveLSLEditor::callbackLSLCompileFailed(), LLPreviewLSL::callbackLSLCompileFailed(), LLLiveLSLEditor::callbackLSLCompileSucceeded(), LLPreviewLSL::callbackLSLCompileSucceeded(), LLLiveLSLEditor::onSaveBytecodeComplete(), LLLiveLSLEditor::saveIfNeeded(), LLPreviewLSL::saveIfNeeded(), selectFirstError(), LLLiveLSLEditor::uploadAssetLegacy(), and LLPreviewLSL::uploadAssetLegacy(). Definition at line 140 of file llpreviewscript.h. Definition at line 139 of file llpreviewscript.h. Definition at line 133 of file llpreviewscript.h. Definition at line 146 of file llpreviewscript.h. Referenced by onBtnDynamicHelp(), onCheckLock(), and updateDynamicHelp(). Definition at line 145 of file llpreviewscript.h. Referenced by addHelpItemToHistory(), onBtnDynamicHelp(), onClickBack(), onClickForward(), onHelpComboCommit(), setHelpPage(), and updateDynamicHelp(). Definition at line 148 of file llpreviewscript.h. Referenced by addHelpItemToHistory(), and onBtnDynamicHelp(). Definition at line 147 of file llpreviewscript.h. Definition at line 132 of file llpreviewscript.h. Definition at line 138 of file llpreviewscript.h.